Both of our daughters are getting married. The younger’s wedding is just a couple of months away, and the older daughter’s wedding is next spring. Once in a lifetime moments happen, and you want to treasure every one of them, but your chronic pain companion will also be a guest at that special event and maybe you are wondering what you can do. Chronic pain is just that…chronic. This means that because it is not particularly flexible, you must be. It is easy to make your pain worse by worrying, fretting, not getting enough rest, and not practicing self-care. Please don’t fall into that trap. Special events are often high stress and these are the times when you need to double down on your coping strategies. Stay focused, and you will have the best time you possibly can. 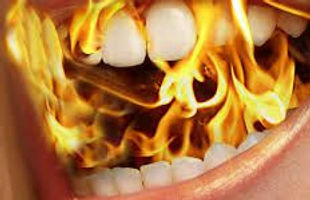 For those who suffer from Burning Mouth Syndrome, that is often all we can ask. Here are a few tips to help you. You knew this was coming, right? Communicate. Talk with your family and tell them that you are so happy to be involved, but that you do need to take the time to take care of yourself so that you can enjoy this time with them. Then actually take the time. You know what I am saying. Don’t cancel that massage, chiropractor, or acupuncturist appointment or whatever else helps you because you think you don’t have time. Don’t put off that workout or run. Don’t skip that appointment with your neurologist or skimp on taking the medicine that helps you most. Just don’t do it. Plan ahead and make sure that you are able to stay hydrated during the event. So, every picture has you with a glass of iced water in your hand…so what! Those pictures will also show you smiling as you use our number one coping strategy and keep your pain as under control as possible. Make sure you take ample medicine with you if you are traveling and keep that on your person, never packed and checked. Get as much rest as you can. Sleep is a painkiller and if you can fit a nap into your celebration plans, do it. They will muddle along without you for 30 minutes and you will feel much more refreshed. More coping strategies, ideas, and research are at the BMS Support Website, so visit today and check out the Facebook Support Group links there, as well, if you are a new BMS sufferer. Don’t miss the magic moments of life. Plan, prepare and then enjoy them in spite of your uninvited tag-along. Wishing you the best! This blog is so recognisable…..I gonne be a grandmother again in februari 2018 and having a wedding from my eldest son end of june next year….BMS is very worse at the moment and I must plan day by day….wich is very difficult…..I try to enjoy the pretty things in my life, as my grandchildren and nature…..without them I was nothing….thanks for your blogs Kali…they inspire me a lot…..